The control desk for Studio B at Chicago’s Earhole Studios, featuring a new 5.1 system comprising five Genelec 8240A Bi-Amplified DSP Monitors for the front LCR array and rear surrounds, with a 7260A Active DSP Subwoofer. NATICK, MA, March 7, 2012 — Original music and audio post production house Earhole Studios in Chicago has installed a Genelec 5.1 Active DSP Monitoring System as part of an upgrade to surround sound mixing capabilities in Studio B. Concurrently, composer and engineer Eric Lambert acquired a Genelec SE (Small Environment) DSP Monitoring System for his home studio to enable him to seamlessly transfer projects between Earhole Studios and his home composition room. The new 5.1 system in Earhole’s Studio B comprises five Genelec 8240A Bi-Amplified DSP Monitors for the front LCR array and rear surrounds, with a 7260A Active DSP Subwoofer. Lambert’s home 2.1 setup consists of an 8130A Digital Monitoring System plus an SE7261A Active DSP Subwoofer, which is designed specifically for use with the 8130A stereo pair. Genelec’s AutoCal™ software, the industry’s first integrated process for automated measurement, analysis and adjustment of every monitoring loudspeaker in the control network, has been especially useful, according to Lambert. The system’s multiple setup capability, in particular, which allows the 5.1 Active DSP Monitoring System to be calibrated for several listening positions, has become very popular with Earhole’s clients, he says. Tom Wiebe, co-owner of Wiebe Music, which was established in the early 1990s, opened Earhole Studios in December 2003, moving the business and staff, including Lambert, into a new location in Chicago’s River North neighborhood. Simultaneously, the company made the transition from a jingle house into an original music and audio post production venture. 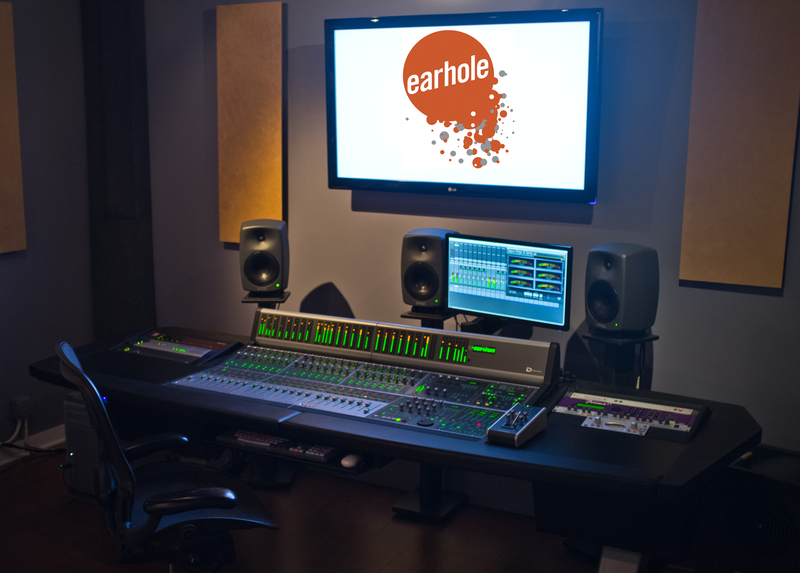 Today, recent Earhole clients include Chrysler, UPS, Sprite, Motorola, Allstate, BP and MGD, among others. Photo Caption: The control desk for Studio B at Chicago’s Earhole Studios, featuring a new 5.1 system comprising five Genelec 8240A Bi-Amplified DSP Monitors for the front LCR array and rear surrounds, with a 7260A Active DSP Subwoofer.